Good afternoon from Butler and Bailey Market. I hope everyone is having a good week! I haven’t written in a while but need to get started back. With the holidays upon us, we have a lot going on that I need to let you know about. Business has been good this fall, so far. It probably would be better if the football team would win more games than they lose. People don’t seem as excited about spending money when they lose, which reflects in our numbers. I have figured out the best way to combat this is to have a beef tenderloin sale. Some of you have probably noticed that around the third week of October every year our tenderloin goes on sale. I probably don’t need to tell you what game that corresponds with. I guess if we ever win that game that will be the end of the October tenderloin sale. I think you are safe for the foreseeable future? The next big event for the store is our annual Holiday Open House. This will be Saturday the 18th of November from 11:00 am to 2:00 pm. 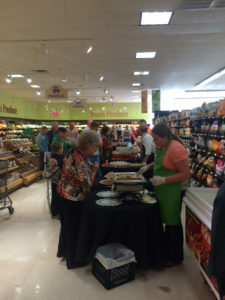 For those of you that have never participated in this event, this is when our store turns into a giant buffet line. We will be sampling all kinds of holiday foods, as well as some of our most popular local products. This is easily the most popular thing we do at the store every year, so make sure you mark your calendar to be here. We can’t wait! The big event after that is the annual Rocky Hill Christmas Parade. It is on Saturday December 2nd at 6:00 pm. Festivities start at 4:00 pm. 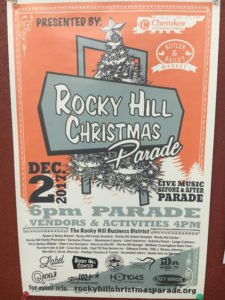 The parade is put on by the Rocky Hill Business Association, and a lot of folks give a lot of their time planning this event. It is quite the undertaking. Josh, from our store, has helped out on the parade committee this year and has told me there will be several new things at the parade to make the experience better for everyone. The parade just gets bigger and better every year. I hope to see you there. Once again we are doing our food drive for Second Harvest. You all have been great supporters of this over the years, and it has started out strong again this holiday season. We typically send them well over a thousand pounds of food each time we do this. We have five and ten dollar food bags already prepared here at the store. So if you want to help Second Harvest, just grab a bag when you are doing your shopping, and we will take care of the rest. One thing that will be different this year with the food bags is we now have to charge sales tax on them. We have never collected tax on them in the past since we thought it was a donation of food to charity but as usual, I was wrong. The reason I know this is because the Tennessee Department of Revenue told me so. You guessed it; the store got audited this year. So when you get audited, the state picks three years of past business and pours over all of your sales, purchases, and any other crap they can think of to agitate you. Once you give them all of the records they asked for, they wait a few weeks and then call you back and ask for more crap just to agitate you some more. This goes on for a couple of months and then they come back with a bunch of questions that my ten year old son could answer. So I guess they only do it to agitate you again. Well after it was all said and done, the only question that remained was about the food bags that go to Second Harvest. So I explained to them that we make these bags, customers buy the bags and put them in a bin. When the bin fills up, Second Harvest comes and picks them up. 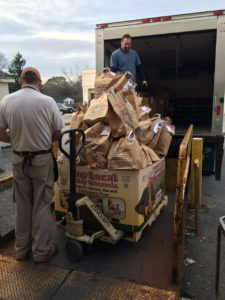 I even gave them pictures of the bags, the filled bins, and the Second Harvest truck backed up to the store for pickup. Well they weren’t going for it, which further agitated me. In the end, they decided I needed to pay sales tax on all the bags we had sold over those three years. So after pouring over three years of my business records, and millions of dollars in transactions, the only thing the state could come up with is we didn’t collect sales tax on our charity food drive. I guess no good deed goes unpunished? Around this same time, a friend of mine was in the store and told me he was going to some statesmen dinner in Nashville. I jokingly told him if he saw the governor, tell him I am not happy about having to pay this tax bill. Well it wasn’t long before a got a phone call from some high ranking politician in Nashville. I told him my story and it seemed to agitate him. He told me he would make some calls and get back to me. The following week, I was driving my son up to Pennsylvania to skateboard camp, and we had stopped for gas. My phone rings and it is a Nashville number. Assuming it was him, I answered. Well, it was the director of the Tennessee Department of Revenue along with a couple of more officials conferenced in. I wasn’t really prepared for a conversation with them sitting in my truck at a gas station somewhere in Pennsylvania, but what do you do? I told them my story, and how I didn’t think it was right for them to tax the bags. After they gave me some long explanation that made no sense to me, they told me I was wrong. I then proposed that I send the tax amount they claimed I owed to them to Second Harvest instead. Wrong again. Well, sometimes I get to the point when I have said my piece and I know it is time to take my ball and go home. That time had come, so I sent them the check and I was a free man again. Obviously this whole ordeal agitated me, but I will say all the folks at the state that I talked to were very nice and took the time to listen to me and explain why they were doing what they were doing. 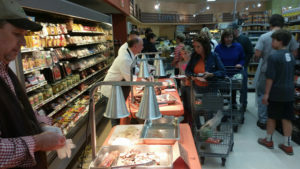 They were also very complimentary of the store and our customers for doing so much to help Second Harvest. They’re probably good folks, just having to do a tough job. 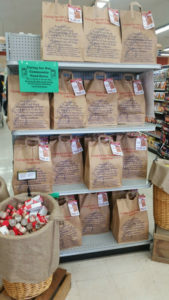 I am sure when they added up the sales tax bill for the bags it was hard for them to believe the customers of a little neighborhood grocery store in Rocky Hill could and would do so much for charity, but they don’t know Rocky Hill. I did my best to enlighten them! Thanks for all of your support of the store and the various needs of our community and thanks again for letting us be a part of your community!